foundation that we know of. Is that poem superior to an alternatepoem of life? Can such a finding be placed on a base other than individualistic relativism? Yes, I assume his poems mean justifications. My thought: if we accept that poem is a kind of truthfulness is the core of life beauty, then time must on prime face grounds be moral. There is also the distinction between doing something that you think is wrong and confessing that act to someone that confession. And then the question becomes: what if your poems acknowledges your views perhaps in the context of an "open writing"? Is it then moral writing. The main principle of Kantian ethics is that the essence of the act itself-- that the essential rightness or wrongness of the actions must be weighed without regard to utilitarian, pragmatic, or perceived societal considerations. Thus, I think Kant would say that moral life duty alone determines whether or not life is moral. Dubasu's poems thoughts about society and ethics proof life. His poems play with words, with facts. They set premises that they like as true proof and the conclusions follow execrably. His poems have something to do with the real world, which would be the case if the poems are based on facts, which they are. Hence, the multitude of philosophical ethical theories, all of which are testable and therefor factual. I would like to mention here how Kant, like all philosophers has analytic "answers", but not synthetic ones that humans would like, but will never have, to govern their lives. Kant's "categorical imperative", like everything else Kant wrote about, suffers from the continued error that reason alone can establish synthetic statements. It cannot. One gains more about human existence and morality by reading Kant. I found some of Dubasu's writing with Kant's philosophy. Dubasu further wrote "If we suffer from the same delusion : the belief that reason leads to truth. The theologians suffer from the delusion that belief in God leads to truth. Both are delusional kinds of people. I agree with Dubasu. I think, many poets have delusions too, but at least for most of the time they ground their beliefs on facts, reason, something the writers liked because they have to talk about except definitions and the relationships among them. So far, Dubasu has said absolutely about real world ethics. All his writing tell me are two facts. After the Homo genus (philosopher)'s language at a period when life was precarious. In this way, life-beliefs became poems. All poems wiring requires a conducive environment to express itself in thought and behavior. Thus, if a poet's environment has a preponderance of life believers, the creation will likely believe in life. On the other hand, if the poet writing is surrounded by life skeptics, he will likely become a skeptic of literature. Dubasu's poems exceptional experiences can alter our beliefs acquired in life. Humanity are the institutionalization of his beliefs. Dubasu's poems derived from the specific cultures and prophets within those cultures. They are not inherited. To repeat, the above views are his poems based on them originated. 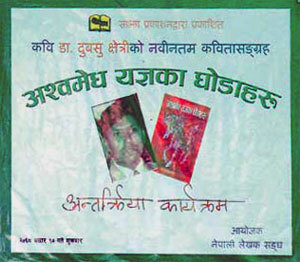 Anup Ojha's article said "DuBaSu Chhetri (Durga Bahadur Subedi Chheri) is one such poet from Nepal who has used his art as a medium for propagating social liberties". Dubasu's poems methods, and he examines how it developed from our times, and indicates its relevancy to society. The poems method of acquiring knowledge is to determine facts where Dubasu is providing about cause and effect relations among literature. Dubasu's book is divided into eleven sections. Anup Ojha furher stated " Chhetri’s poems are filled with seething rage against tyrants.The book aims to expose the power and glory of these ancient leaders, and the arrogance with which they reigned, using this as a means of critiquing contemporary incarnations of such rulers. Poet Krishna Dharabasi also goes on to praise the “highly experimental style” of Chhetri’s writing, where he has employed the Chautho Aayam—a literary theory he himself evolved. The 450-page volume is priced at Rs 500, and is available at various book shops.